I almost didn’t see it. 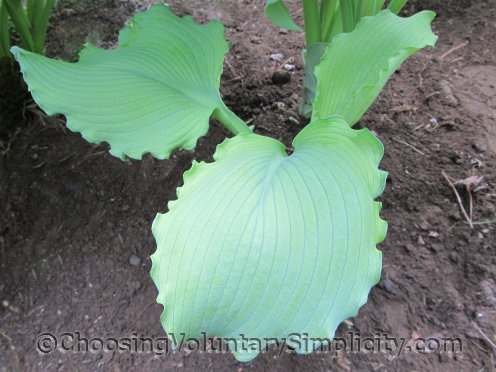 My interest was in the larger bluish hosta and the interesting ruffled edges it is starting to develop… and in tackling the dense carpet of out of control weeds in the garden that serves as a nursery for some of the smaller volunteer hostas. Once I got rid of most of the weeds, there it was… nestled under the larger plants… a tiny three-leaved hosta seedling with very distinct pie crust edged leaves. It’s already a beautiful little hosta. But there’s another plus that doesn’t really show up in these photographs… this tiny hosta is exactly the shade of soft yellow that I am trying to encourage! 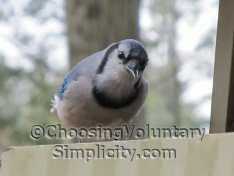 I wonder what it will look like this spring… I’ll be keeping an eye on this one. Really interesting edges. I hope you will keep us apprised of the progress of this hosta. I’m so excited. This year I have seeds to plant. 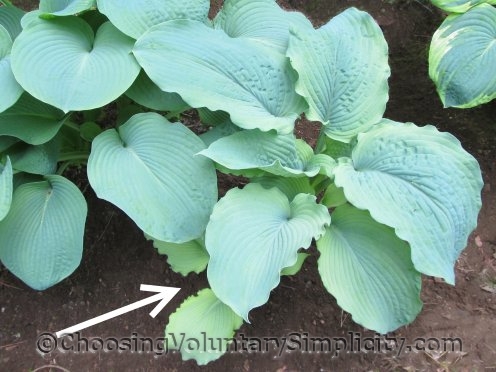 Your seedlings certainly disprove the belief that hostas from seeds are only ordinary green. These will be my first seeds planted and I don’t care what they turn out to be like. I’m just excited to start the process.